Do you groom your own dog? 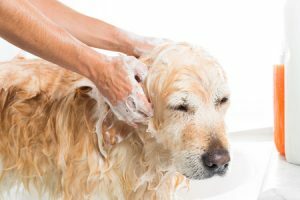 There are common dog grooming mistakes pet owners often make, and you might be doing some of them. First, there’s the issue of how often you groom your dog. If it’s only once a year, no wonder your dog is so full of anxiety when you try to get him or her near a showerhead of water! Dogs need to get used to being groomed, and if the groomings are “rare” in your house, they’re going to be ridden with anxiety and not like the process. It’s better to establish a connection with a professional groomer who will get to know your dog over time and be someone he or she sees every few weeks… that way it’s like giving your dog a play date– a chance to socialize with someone else whom they come to like seeing! Professional dog groomers also serve as health checkers– if they spot anything unusual, they’ll let you know so you can have a vet check the dog out. Also, what about grooming clippers? Like brushes, there are certain clippers for certain dogs. Many do-it-yourselfers use whatever clippers the local pet store had in stock– but they’re usually not the right kind of clippers for their pet! Professional groomers, on the other hand, have all the right tools for clipping a wide variety of dogs. Ever clip your dog’s fur only to find it looked “a mess?” It’d be better to have a professional do it (much like cutting your own hair versus going to a barber/stylist). Finally, there’s rinsing, which often involves a pet owner giving up in frustration mid-rinse… and then soap lingers. Have you ever made the mistake of not getting all the soap residue off your dog? Then their skin is irritated, and they itch. Dryness helps lead to further matting– no bueno. A professional groomer uses the right equipment, water pressure and water temperature to properly rinse a dog. D’Tails Grooming in Augusta, GA, is where you should take your pet dog for regular grooming sessions. Please call 706-731-0089 to make your appointment.